This is useful when you are sharing the chatbot link via email or facebook or any other social channel and want to reflect your own brand. 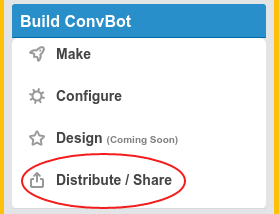 Go to "Distribute" section of your ConvBot and download the html file. Now upload this html file on your server on any url of your choice. That's it. Pro Tip: If you want the bot URL to be something like https://mydomain.com/chat-with-me then you can rename this html file to index.html and put it in a folder named chat-to-me.